Sandals are the most convenient and comfortable kind of footwear that keeps your feet at ease throughout the day. 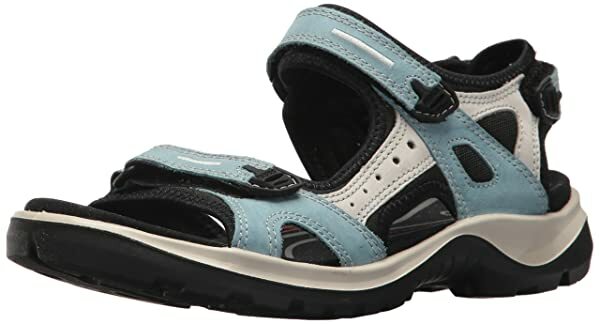 When it’s about everyday wearables, the search for the best walking sandals for women becomes especially hard because you need something stylish, durable, and extremely compatible with the feet. For women, there are copious choices available in the market. They look attractive and tends to give you effortless walking experience. 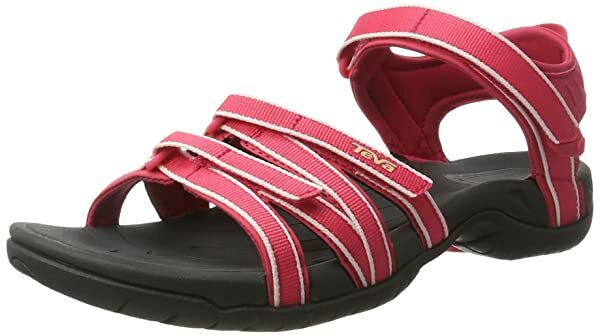 In this review of best walking sandals for women, I will walk through some crucial points to keep in account while looking for a product and also make personal favorite recommendations on the same. 1 How Are Walking Sandals Better Than Going Out Sandals? How Are Walking Sandals Better Than Going Out Sandals? Walking is an integral part of our routine. Even if we are not walking outside on the road a lot, the commute inside the offices is big enough to take a toll on our feet. The designer sandals that you see these days mostly have heels or wedges. It is impossible to walk comfortably in heels, especially on a daily and on different kind of terrains. I have a sister who is a member of the cabin crew. You can understand that wearing heels is part of their job. No matter how trained you are in wearing heels, they are and will always be a complainable hassle. While moving, the back part which is lifted of the sandal is considered to be good for the spine. It must not come to you as a surprise that the sole of most comfortable women sandals has thicker soles. Also, these have a little bit of a heel. The slim platform of the footwear makes it super easy to walk on the uneven platform or rocky terrain. The high-street sandals usually have thinner sole. Imagine putting your feet on a rock with such footwear; you will regret ever purchasing such a waste product. Here we solve the first mystery that the best walking sandals for women must have a thicker sole to undertake different terrains. Also, because it is about the walking sandals, make sure that they have flat soles so that your feet are stationed at ease all day. Even if you have to run in such sandals, they will not give you any hassle. Rubber outer sole seems to be a good idea as far as walking sandals are concerned. The traction provided by the rubber outers is remarkable. Another amazing benefit is that there is less possibility of you slipping or twisting an ankle while walking on difficult roads. The designer or general sandals for women usually have slippery soles. Such sandals are not suitable for casual walking, day to day usage, and especially not for hiking. Let me share a simple rule with you. Always try driving with your sandals. If you find them comfortable while driving, then they are suitable for hiking and routine walking. In case you find them difficult to manage then never think of them as good hiking sandals. In the same concept, there is one more thing called ankle and arch support which is equally important. The straps on the sandal should be thick and a lot in number to keep the ankle at right posture. The thinner straps are not highly durable. They can slip-off and lead to accidents. Also, they are not able to provide any support to the wearer. When the term walking is used, the first thing you want to buy for your feet is a comfortable pair of shoes. While you have to compromise with the aesthetics, you will find walking sandals way more comfortable and durable. As far as the designing element is concerned, the prime motive of creating walking shoes is to give extra emphasis to the feet and not on the fancy part. You might like some of the designs or perhaps not but certainly, the designer sandals are showier than the walking sandals. Well, after reading this statement, many women might want to take an exit but I would like to say that you should compromise a little on looks if your feet are at ease. At the end of the day when you sit relaxed and your feet are sore, you will not appreciate the designer sandals at all. You usually get plenty of chances to show off your stylish sandals, why do it on a routine basis and make your feet miserable. Make sure they are closed-toe, especially while going out on rough terrains. They will save your feet from getting hurt. The weight should be carefully examined. The high-quality sandals are usually very light in weight. Make sure that the sole of the shoe is thick enough to prevent any accidents. The rubber sole is ideal so that you don’t accidentally slip. So, now I am going to share some of my personal favorite models in walking sandals for women. All these products are picked after thorough research and most of them have been used by me personally. I hope all these will be helpful for you. Plaka is a new brand, and they have gained a reputation for being the finest ones in the industry. Starting with the look of the sandals, these have several thick strings on the top and rubber sole. As you know, rubber sole sandals are not only excellent at providing traction but also limits the threat of slippage. The braids on the top are hand woven and made of explicit and durable material so that they don’t break in between. The straps are made of stretch-to-fit soft nylon, and they are entirely skin-friendly. They are useful to wear with any attire you have in your closet. Also, if you are walking on the rocky terrain, these will be utterly suitable because of the thick sole. It will not let anything to bother your feet. The sandals are water resistant, so you can comfortably wear them to a beach or for kayaking. The fit is also remarkable. Women of all ages can wear these sandals. There are 14 color options available in this that you can try. Plaka makes sure that you don’t have to compromise on the looks while looking for comfort. 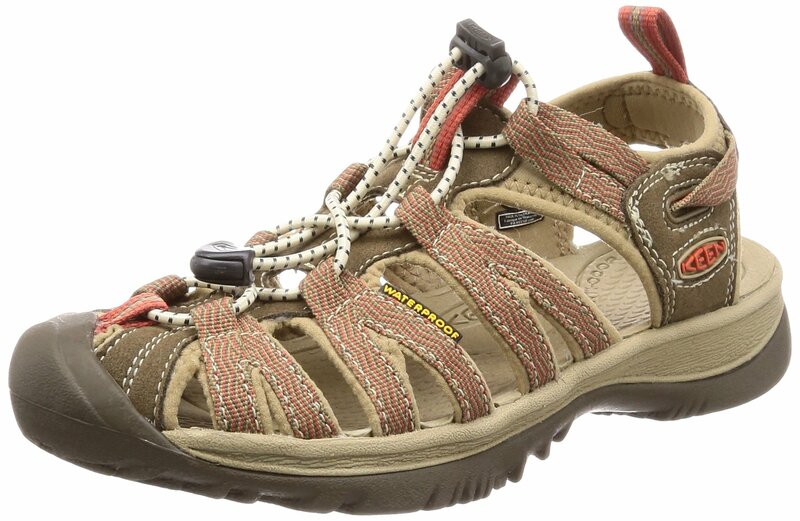 So, if you are an avid hiker and likes to climb mountains, then the Keen sandals will be highly suitable for such needs. If you can excuse the looks, this model is great in features and qualities. Technically, these make an excellent choice for walking and hiking. The price is also fair enough. The top of this sandal is covered with a mesh of elastic laces and mesh. Because of the metatomical footbed design, the straps are super comfortable and provide excellent traction to the foot. Coming down to the sole of the sandals, I have repeatedly been claiming these are best for hiking because of the thick rubber sole. It does not let any rock or outside element to come in contact with your feet while walking down the mountain. Seriously, these do not look very attractive, and maybe because of the looks, you might want to change your decision, but I would say that these are amazing as far as comfortable walking is concerned. They are available in various color options and sizes. You can check out the colors and buy the one that suits your personality. Clarks is among the most recognized brands that design and manufacture top-notch quality footwear. This model is another masterpiece created by the company in leather material. While the material is leather, they still don’t require a lot of maintenance. The flower design on the top gives it a feminine touch. The color options available in this model are 6, and they come in both, metallic or matte finish. Also, these sandals are available in half-sizes and different widths to give you more choice while selecting the size and fit. The outsole is made of rubber material so that you can enjoy better traction. However, it is not highly suitable for slippery terrains. The heel strap is adjustable with hook-and-loop closure. The other two has a flower on the top and are non-adjustable. However, they do have stretch-gore inserts that give remarkable fit. These are a perfect fit if you need something with immense support. You can wear them with all kind of attires. The Ortholite footbed with Cushion Soft Technology makes them highly comfortable for everyday walking. In the first glance, you might find these sandals extremely simple, but they have decent looks that one can carry with various outfits. And of course, these are among the most comfortable shoes in my review today. So, Vionic gives you massive selection in colors and designs. So, you will probably find something fantastic for your taste. 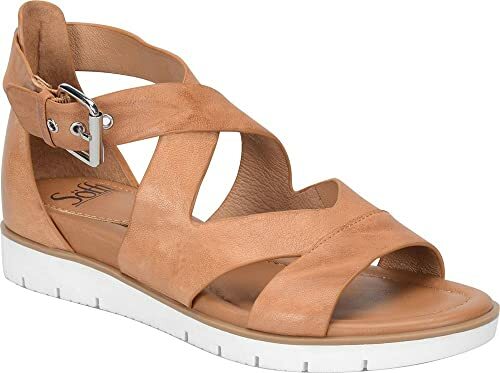 As far as size is concerned, if you wear a half size then prefer ordering the smaller size for example, if you usually wear 7.5 sizes then order 7 in these sandals. All the four straps on the top of the sandals are adjustable. You can adjust them to fitting. Then there is innovative Orthaheel technology that is biomechanically designed to cover the arches so provide the most excellent support. This technology is also useful for people with heel pains. The outsole is made of rubber and has patterned tread to give excellent traction on all surfaces. The EVA midsole is lightweight and extremely comfortable. Unlike other models in the market, this is also shock absorbing. This technology is combined with microfiber-covered footbed for more exceptional comfort. These sandals are not only pretty but also extremely functional. This is another fantastic option for the hikers and women who walk for miles. Starting with the design, it has an ergonomic design that is quite amazing in looks. The overall coverage is also praise-worthy. The sizes are available in abundance. Also, there are multiple styles and designs in this model that you can choose. Other significant features such as rubber sole that prevent accidents and give you excellent traction are there. 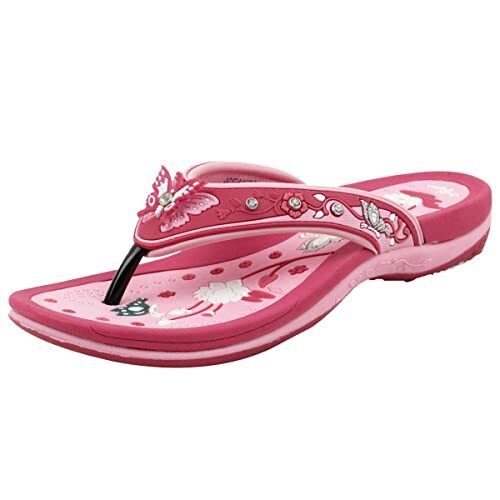 Also, the ergonomic bottom gives fine cushioning and flexibility to the sandals for all-day comfort. There is contoured bedding for lite arch support and sandals are also able to absorb shock. They are comfortable to wear and come with an easy on or off the snap lock with magnetic closure. Also, these have convertible side straps to wear as slide sandals. The sandals are great for outdoor activities. Plus, these are waterproof so you can wear them on a beach as well. Machine washable so doesn’t have to do all the washing efforts your self. Moreover, the textured footbed offers extra grip while the feet are wet. If you have extra wide feet then better purchase a half size up. This is a model of consideration. Ecco is another far-fetched brand that manufactures superior-quality sandals. This particular model is for the hikers and women who walk on uneven terrains. While the looks are not as stunning, the comfort level is to a large extent. This model is made of leather and textile. It is lightweight and effortless to maintain. The sporty look of the sandals features an omnidirectional rubber outsole with dual hook and loop closure. The fitting can be ensured from the straps at the top. To ensure long-lasting cushioning, there is direct-injected PU midsole foam that also provides all-day comfort while walking. Also, there is receptor technology for excellent stability and dynamic support. The fitting is further enhanced through multiple adjustment points and neoprene lining. The molded EVA footbed and microfibre cover make sure that the foot can enjoy maximum stability. There is a massive versatility in colors that you can choose. While there are countless amazing things about sketchers, one of the best things is that it is incredibly affordable and widely available. Starting from designing to overall comfort, this model is an answer to all your expectations. There is a mesh of straps at the top in which the heel strap is adjustable. If you have incredibly slim or full, fit them you might have to struggle to find the right size. Also, the straps are thin. However, this won’t be a problem because they are available in a lot of variety. All these will do a great job in keeping the feet at a right angle and providing excellent support. The heel strap is supported with Velcro closure which can also be removed from the sandals when you want to wear them as flip flops. There is contoured memory foam footbed for additional arch support and comfort. Also, the midsole is shock absorbent so you can run or jump while wearing these sandals. As far as traction is concerned, the flexible rubber outsole offers the most exceptional grip on slippery surfaces. Lastly, you can also find a lot of versatility in designs and styles. Make your best pick. So, this is another model of my list because it has a humongous collection of colors and styles available. Some colors are striking and pleasant to the eyes. Everyone can find a suitable design as per their liking. I own three of the colors from the options. Anyways, the features are also splendid. There is rubber outsole with water challenging lugs paired with cushioned sponge EVA top sole. The midsole too is made of EVA technology and is compression molded. All these features are incorporated to provide utmost comfort to the wearer. Irrespective of the terrains you choose to walk, the sandals will not let anything reach your foot. 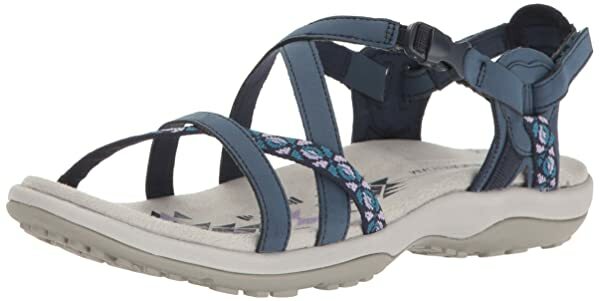 The upper of the sandal is designed with various adjustable straps with hook and loop closure. These also make sure that feet are perfectly safeguarded. Then there is nylon stability shank and shock pad heel that are usually found in some of the best walking shoes. These sandals will keep your feet safe and secure, anywhere you go. 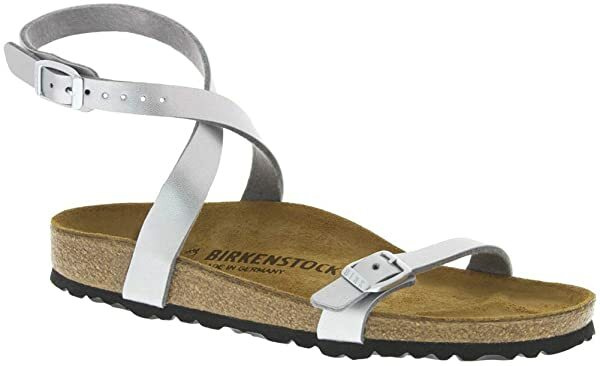 The Birkenstock sandals are most stunning in looks. The difference is about the sole of the sandals. Unlike other models mentioned in the list, this one has got synthetic sole. Ideally, this is comfortable everyday sandals but not recommended to wear in rain or slippery surfaces. It has got two adjustable straps. The closures at toe and ankle allow you to ensure a perfect grip. Whether you have thin feet or wide ones, the straps will help you in fitting the feet inside the sandal seamlessly. Also, there are breathable leather lining that keeps the feet at ease for all-day long. The raised toe bar is designed to boost the natural gripping motion of the feet that aids circulation. To ensure that the sandal takes the shape of the foot, this model has got contoured footbed. The EVA outsole makes sure that the weight of the sandal is manageable. This pair is shock absorbing as well so you can easily land at a difficult terrain without any trouble. This is a great overall design that every woman will love to own. This is the concluding model of my list from the brand Sofft. It is incredibly fancy and stylish in appearance. You can comfortably wear it at a party as well. These are everyday walking sandals but exceptionally perfect for any occasion. The top of the sandals has a mesh of non-adjustable straps. The ankle strap is adjustable, but the other belts are so rigid that they can give a smooth walking experience. About the sole, this model is designed with synthetic sole. As I said before, the synthetic sole is not suitable for slippery surfaces. The 1.5 inches heel can give you some extra height also. The leather top bands boost the durability of the sandals. The sandals keep your feet at ease and completely breathing so that sweat does not collect in it. It is generously cushioned so that you can comfortably wear then all-day long. This is stylish as well as an extremely fantastic product that you can use for parties or everyday wearing. There has been a tug of war between fashion and comfort in women footwear. The walking sandals are ideally purchased to provide the utmost support and encouragement to the wearer. In this section, I will discuss some more essential tips regarding women sandals. The sole is made with different materials. However, you should always prefer rubber material for all-day comfort and slip-free experience. One should always carefully check the number of straps on the sandals. They should either be thick and broad or too many. Usually, the sandals tend to slip on wet surfaces. However, the rubber soles can give you the most excellent balance on slippery surfaces as well. Also, you will need to wear sandals during rain so the manufacturing should be such that the sandals don’t break after exposure to water. These are some of the mandatory tips that every buyer should keep in mind while purchasing the best walking sandals for women. 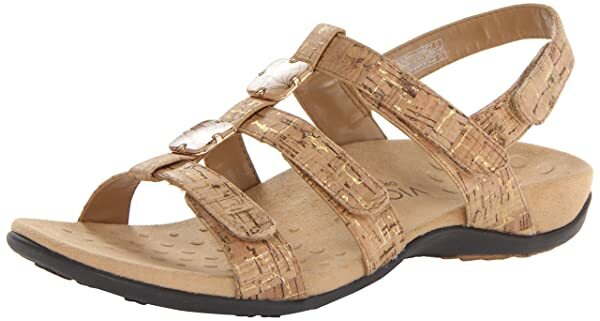 So, as I end the best walking sandals for women review, I would like to highlight two prime models that are my personal favorite. 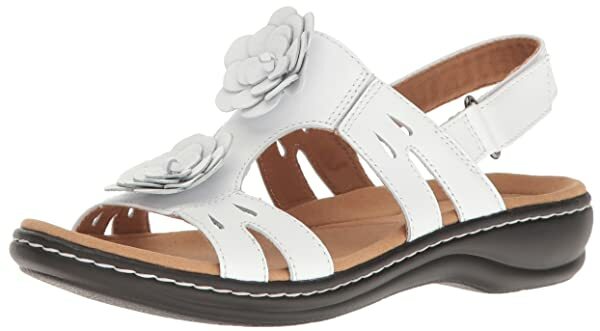 The Vionic women’s sandals are my absolute favorite for the kind of features it has. I have used them and found it extremely comfortable. Also, in the hot summer days when I have to run errands for my kids, these sandals kept me at ease. I love the style and the small heel. I know you might want hefty outsole, but to me, the sole that I got in this model is excellent. It does not let anything reach my foot at all. When I have to go hiking with my family, I take out my Gold Pigeon sandals that are incredibly comfortable and compatible with outdoor and rocky terrains. These are waterproof, rustproof, and extremely durable. I support all the models that I have mentioned in the list, but these two are my favorites. Stay tuned with us for upcoming amazing reviews on shoes and sandals.